nerds of a feather, flock together: All Hail the Black Company! All Hail the Black Company! 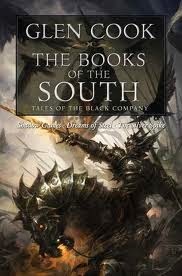 Thoughts on Glen Cook's Chronicles of the Black Company (The Black Company, 1-3) and The Books of the South (The Black Company, 4-6). Hot damn! He had me at peyote. And Vietnam War fantasy fiction in the 1980s? That's just an added bonus. I also grew interested because Glen Cook's series presaged the darker turn in fantasy--to the grit and darkness that we now tend to associate with writers like Joe Abercrombie, George R.R. Martin, Steven Erikson, Scott Lynch, and Ian Esslemont, to name but a few of the good ones. But Cook's original novel, The Black Company, was written in 1984. That's nearly thirty years ago! Twelve years before A Game of Thrones! So I expected a rather quaint version of grimdark (a quaint pseudo-grit?). After all, wasn't Cook writing in the era of Terry Brooks and David Eddings, when heroes existed to save kittens, pet bunnies, fulfill prophecies, and tell the reader that the world will work out just fine? Was I ever wrong. The Black Company is gritty fantasy at its grittiest. But there is no hint of grimdark for shock value; it is grimdark done right in every respect. The world, granted, is extraordinarily violent, with much of the northern continent embroiled in a violent uprising pitting the forces of "good" (epitomized by the League of the White Rose) against the forces of "evil." But the reader soon learns that most who support the League of the White Rose are no less prone to violence, murder, and sacrifice in the name of their broader cause. But this violence is no mere splatterporn. Instead, it is the violence of Homer or the Eddas, where the deaths, the struggles, the burnings, beheadings, and overwhelming brutality are lenses through which the author explores the issues of morality, virtue, and duty in human nature. And it is this violence that convinces Croaker, the Black Company's physician and Annalist, that there is no good or evil in the world. There is only power: those who have it versus those who do not. In this violent world, the Black Company is perhaps the most notorious mercenary group, one well-known for its battle prowess and commitment to its duty. They care not who they serve, as long as their employer pays them often and on time. In an interesting turn of fate [and a subversion of normal tropes of the time], one of the twelve "Taken," Soulcatcher, brings the company in the service of the Lady. Most in the Company care little for the fact that they serve evil. Croaker and company are no Rand al'Thor, seeking to rid the world of darkness. Instead, they care much more about doing their utmost to fulfill their contract, regardless of whom they serve. From this point on, the reader finds himself/herself cheering for a group that is on the wrong side, and decrying acts of depravity from those who are supposedly on the side of "good." This was revolutionary for the time... it turned upside down the shockingly one-sided sense of morality prevalent in 1980s and early 1990s. And most shockingly for me, it still feels fresh and inspiring today. 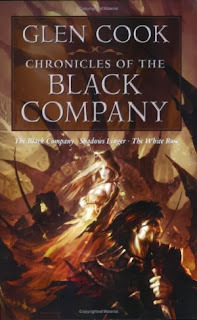 The Black Company is written primarily as a first-person narrative that records the thoughts of the company Annalist, Croaker. It is understood that Croaker sees it as his duty to record and reconstruct events as he understood them. He writes in a sparse and minimalist style (think Hemingway) that leaves much to the imagination. Some might find this awkward or difficult, but Croaker's blatant cynicism and world-weary style help create a picture of a company that really has seen too much bad in the world. Where The Black Company really succeeds is in its character depth and development. Although The Black Company is written primarily as a first-person narrative, Cook highlights the human element with vignettes that really take you into the minds of the characters. Croaker, the physician and company Annalist, is a jaded older man who, against his own better judgment, finds himself almost hopelessly infatuated with The Lady. He becomes so obsessed that he actually draws her attention, sometimes in problematic ways. But this sets the stage for an exploration of The Lady herself, providing an interesting glimpse into a woman who has unfathomable power but longs for a real human relationship. Raven is a man who could look death in the face and laugh, but finds himself running away from his past and his emotions. One of the most powerful characters in the story is a deaf-mute. Silent, a Black Company mage, from time to time suffers a deep-seated conflict between his vow of silence, on the one hand, and his desire to reveal important information that could save lives, on the other. And the sorcerous power of Limper, one of the powerful yet pitiful Taken, is perhaps only surpassed by the pain of his tortured existence. The camaraderie of the soldiers, more than anything else, helps make this story a true classic. Glen Cook really brings to life the interpersonal relations, the conflicts, and the camaraderie within the company. Cook, after all, was a navy man, and spent part of his time attached to a Marine Force Recon outfit. Luckily, he left active duty a month before his unit was sent to Vietnam, but this experience no doubt makes his characters, and the units in which they operate, feel more authentic. Although they look out for each other and would likely die for one another, many of the company members squabble like family members. Goblin and One-Eye--two of the three company mages--frequently play practical jokes on each other and try to best each other magically, which allows for a great deal of darkness-cutting hilarity. Goblin and One-Eye provide much-needed comic relief, lightening the mood from what is often a darker exploration of human nature. The Books of the South are much darker, and much more introspective. They follows the story of the Black Company as it moves across the southern continent, trying to understand from whence it came. The answer is much darker than I was prepared for. Moreover, the story on the southern continent is not balanced with the same comic relief we find in The Chronicles of the Black Company, and at times the characters make rather strange decisions. Most frustratingly, The Books of the South remains an incomplete story. The last book, The Silver Spike, is out of place, to say the least. Instead of providing an end to the story arc I had become invested in, it jumps back to the northern continent. Nonetheless, The Silver Spike is the true gem of the collection. It features Cook's best and most powerful writing, provides a glimpse into a town on the precipice of a possible massacre, and explores the mindset of a group of thieves who will do anything to survive. Both collections should be required reading for fantasy enthusiasts. They feature the best of what has become known as grimdark. And they still feel fresh, even after thirty years. Highly recommended.